When the Second Palestinian Intifada broke out, a group of Palestinians and Syrians set up a protest tent in Arnous Square in central Damascus to express solidarity with their brethren in occupied Palestine. Oday was as young as seven at the time, but he regularly participated in the demonstrations against the Israeli occupation, memorised Palestinian revolutionary songs, and attended the sit-ins along with his mother who was among the organisers. Eleven years later, Syria was to have its own intifada, an intifada against a home-grown occupier. And Oday, who was studying political science in Lebanon at the moment when Syria’s uprising for freedom and dignity began, would know exactly which side he was on. The ever-smiling young refugee who demanded freedom for Palestine at the age of seven would, eleven years later, demand freedom for both Palestine and Syria, stressing that both demands go hand-in-hand. Many now-retired Palestinian revolutionaries, together with the bulk of left-wing intellectuals, would either unashamedly support the Syrian regime or demonise the Syrian revolution, shrouding their positions with the cloak of neutrality and objectivity. In sharp contrast, Oday, like an entire generation of the youth of Syria’s Palestinian camps, relinquished the safety of silence, spoke truth to power, and reclaimed the Palestinian cause exploited and appropriated for so long by the Syrian regime and its apologists. 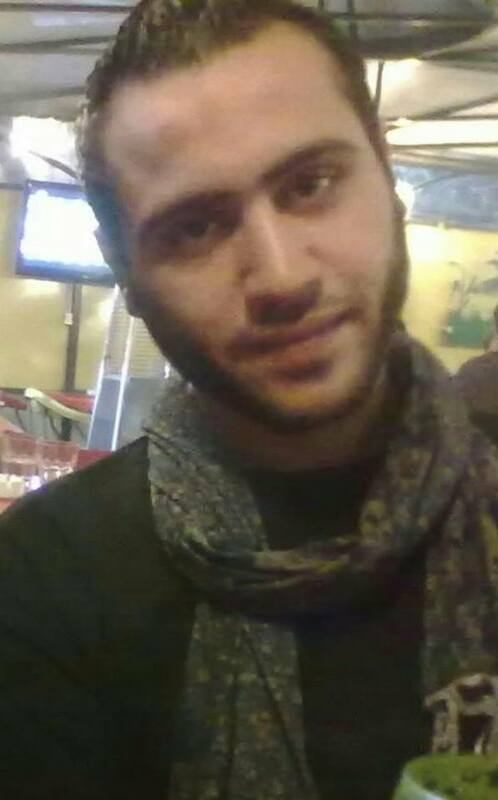 Oday was to leave his studies in Lebanon and return to Syria shortly after the uprising’s outbreak. Combining peaceful and civil dissent and organising together with diligent relief work, he sought to help civilians and those displaced, who became trapped under the regime’s state of siege in places such as Yarmouk by bringing in food and medical supplies. In the current situation, where too many continue preaching neutrality and insist on an exclusively humanitarian discourse regarding Yarmouk’s plight, it is essential for us to learn more about Oday and the hundreds of Palestinian refugees in Syria who have been arrested, killed, or tortured to death in Syrian regime jails for attempting to break the siege on Yarmouk. While for the neutrality discourse it may be convenient to suggest that “both sides” are equally culpable for the humanitarian catastrophe in Yarmouk, this apolitical argument is anything but: on the contrary, it condones collective punishment and systematic starvation, de-contextualises the suffering of besieged civilians, and overlooks the fact that thousands in Syria, including many Palestinians, have paid with their lives to break the siege on the Camp and other besieged areas. We might ask ourselves: how one can express a genuine form of solidarity with the people of Yarmouk without unequivocally holding the regime that imposes the siege on Yarmouk responsible? How can one demand to “save Yarmouk” while remaining silent about those who were arrested, sniped, and tortured by the regime, precisely because they tried to save Yarmouk with actions that do not take the form of begging? How can our moral outrage be so selective as to show solidarity with Yarmouk without uttering a word about other besieged areas in Syria? It took several deaths by starvation for the so-called “pro-Palestinian” activists to launch timid solidarity campaigns with Yarmouk, but even when they finally did, they embraced a similar discourse to the one consistently propagated by liberal Zionists and humanitarian agencies. This discourse condemns the siege without explicitly condemning the army maintaining it and uses the presence of armed opposition forces inside the camp to justify a suffocating siege by the regime. It took the so-called pro-Palestinian activists more than six months of complete regime siege to remember Yarmouk. But what would it take for them to launch campaigns demanding the release of Palestinian prisoners inside Syrian jails — or would that violate the sacred neutrality principle they ostensibly uphold? In a recently-published report, The Democratic Republic Studies Centre documented the death of 119 Palestinian detainees under torture in Syrian regime jails since the start of the Syrian uprising. The number is 46, more than those Palestinians killed under torture in Israeli occupation jails since 1967. Nevertheless, the harrowing fate of Palestinian prisoners in regime jails has warranted no outrage —let alone active campaigning— by those who allege to champion Palestine. The tears that Oday’s mother sheds while listening to one of her son’s favourite songs are no different from the tears shed by Palestinian mothers over their children jailed by Israel. The steadfastness with which Oday’s mother received the news of Oday’s arrest is no different from the steadfastness of mothers whose sons are jailed in Israel. What is different, however, is that Oday’s mother cannot hire a lawyer for him, and does not even know where he is jailed, because, in Assad’s Syria, asking about a prisoner has become one of life’s gambles. The case of Palestinian prisoners in Syria must be a priority for anyone who supports the Palestinian cause. Oday Tayem, the Palestinian-Syrian whose identity was greatly influenced and shaped by the Palestinian as well as the Syrian intifadas, is one among thousands of Palestinians and Syrians caged behind Syrian regime bars. Let those who dare argue with them and only with them that the freedom struggle of Palestinian prisoners in Israel is separate from the struggle of Palestinian prisoners in Syria. Let those who dare deny to them and only to them that the siege on Yarmouk is imposed by a regime that has purposefully punished peaceful activists and relief workers in Yarmouk, at times by death. Let those who dare throw at them and only at them suggestions that Palestinian prisoners in Syria are to become mere figures; figures whose freedoms are now to be up for mere negotiation.